When I first started eating vegetarian, one of the things I noticed right away was the lack of flavor restaurants would use in their vegetarian options. It was almost as if vegetarian was synonymous with: “oh you don’t eat meat? That must mean you want a big pile of vegetables with nothing else or pasta, lots of pasta.” It’s not that I wouldn’t gladly eat my weight in fresh vegetables, it was just I wanted something more. Of course, this all changed when I moved to California but I think my awareness of flavor really helped me find my path in the kitchen. 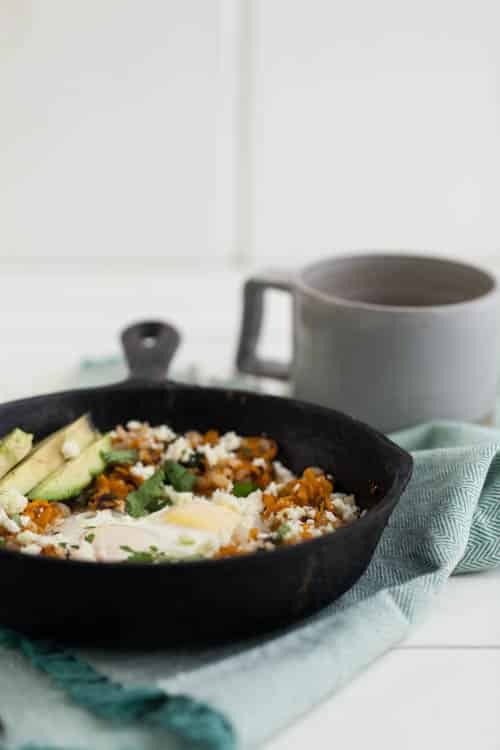 This egg skillet is a prime example of how a little spice goes along way, especially because chipotle sweet potatoes are are perfect together. If you take a look in the recipe section, you will notice that egg skillets are one of the more prominent recipes. It’s relatively easy to cook a few vegetables and crack an egg or two in the middle. Most of the time, the skillet can be ready in about 20 minutes. 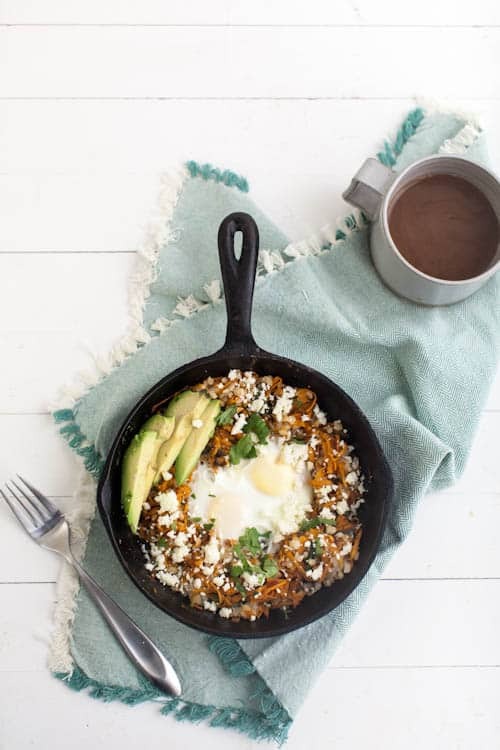 This chipotle sweet potato skillet cooks up quickly thanks to shredding the sweet potatoes and using precooked rice. Also, if you become a lover of egg skillets like myself, I recommend picking up a nice cast iron skillet. Spice: Chipotle powder can have some heat to it. If you’re looking for something a bit more mellow, try 1/2 teaspoon of smoked paprika combined with 1/2 teaspoon garlic powder. Beans: Looking for a bit more protein? Add in 1/4 cup of black beans with the rice. Oh man, this skillet sounds so good! I love adding spices to my smoothies to give them extra flavor. I especially like adding freshly ground cinnamon, nutmeg, and cardamom. Wow this looks incredible! and with such simple ingredients! Your five favorites are also mine but I would add nutmeg. There’s nothing better than adding nutmeg to oatmeal or fettucine alfredo. yum! 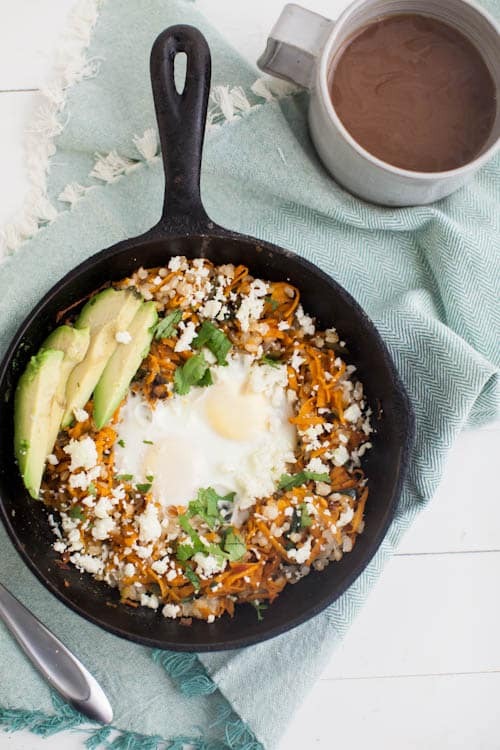 i just posted a chipotle sweet potato breakfast skillet, as well. it’s one of my favorite spice combinations for sure! i also love curry with roasted cauliflower, smoked paprika on eggs, and ginger and black pepper in a nice, warm digestion aiding tea. This looks amazing! Putting it at the top of my recipes to make list! I love the flavors of cumin, chili and cilantro! My newest favorite has become smoked paprika! Yes to this!! I get so irritated when the only item without meat is a salad or something boooring. My absolute favorite spice is smoked paprika, best ever. We apparently have similar taste buds! Four of your five favorites would be mine as well. I loved roasted carrots and sweet potatoes. I almost always add chipotle, cumin, and paprika to the potatoes and cumin to the carrots. And oatmeal is not oatmeal without cinnamon. Nothing new and inventive, but definitely delicious! Love paprika, and also turmeric, especially mixed in with jasmine rice! (I’ve tried adding cashews and dried cranberries, and it’s amazing.) I’m never sure what to do with cinnamon though, since I don’t bake! I love a hint of cardamom in my desserts of coffee and tea. Ginger goes well in both sweet and savory dishes. Versatility is key! I love baking with cardamom. The other night I made a stir fry using Bragg’s Amino Acids and siracha sauce! Not really “spices,” I know, but it was great and so simple! My favorite way to use spices is in soup. It is amazing what a teaspoon of smoked paprika or quarter teaspoon of chipotle powder can do to make a soup more complex. And delicious! I had a vegetarian sandwich the other day from a local deli that consisted only of lettuce, avocado, sprouts, and tomato. No seasoning. at all. It was terrible. I must make up for it with this big skillet of flavor! Cinnamon is one of my favorite spices – baking with it always makes my home smell amazing, and using it in something savory adds something really special. My favorite new spice is Harissa! Just a little bit goes a long way in punching up everything from my lentils for lentil tacos to chilis and soups. I love adding a dash of cayenne to my dishes. It can really pep up some soup! This sounds like such a delicious, hearty combination! You have to love spicy sweet potatoes combined with rich runny egg yolk. 🙂 My favorite spices are way too numerous to count–so I’m just going to pick the classic freshly ground black pepper. Now that’s a spice I cannot live without! Thanks for the giveaway opportunity! My favorites would be cumin, curry powder, red pepper flakes, cinnamon and nutmeg! 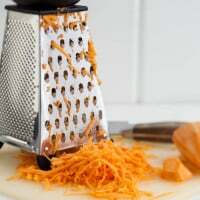 I love nutmeg in dishes with squash or sweet potatoes and cinnamon with chocolate. I love red pepper flakes in and on everything. They add the right amount of zing to homemade salad dressing, pizza, etc. I love using a dash of cayenne pepper to my dishes to spice things up a bit! I must say, I love cinnamon…I eat it almost every day! But, I think my favorites are cumin, coriander and fennel seed! Always use the whole seed, toast it in a dry pan then grind, or sizzle it away in oil, the flavors that are coaxed out with these methods are amaz-zazing! My faves are cumin, coriander, Chili 3000 (from Penzeys) and 21 seasoning salute (salt free) from Trader Joes. I use 21 seas. On all roasted veg. My new favorite is Mujadarra(?) lentil and rice with cumin, paprika, coriander – yum! I live near a large Indian community with flavor influences from them, so Garam Masala (a warm spice blend) is a favorite on lots of veggies. Cardamom is a favorite for porridges because it reminds me of their rice pudding with cashews. And I’ve loved the variety of salts I can get in my neighborhood farmer’s market: alderwood smoked salt for a pronounced smoke flavor in veg stews and the occasional meat dish, vanilla salt on porridges and caramelized veggies, balsamic salt on salads and roasted veggies. No kidding about the restaurant comment! Whenever I see ‘seasonal vegetable medely’ on the menu I can usually guess that it will just be whatever vegetables they need to get rid of (regardless of whether they go together), blandly steamed with only too much salt as the spice, and topped over a mushy pile of rice. No thank you. Also, I’ve been pretty obsessed with turmeric lately. It’s been connected with helping keep immune systems strong and fighting off colds during this (particularly) cold Midwest winter is a daily occurrence. I’ve been throwing it in soups, curries, and even mixing into juices and teas. Boring… Probably. But I love the seasoning fresh ground pepper! It is the simple things that make it super delish! And I put it on practically everything! This looks delicious–I love your breakfast recipes! I love spicy combinations like Tai Cha, cinnamon,nutmeg, cloves,ginger and ground black pepper in cookies ,muffins, pancakes ,waffles, cakes and hot tea. i have become very fond of cayenne and ginger in my morning ‘tea’ with honey and lemon. great combination; great way to start the day. I have the same favorite 5 spices! They go on everything. I love to make a pumpkin and red lentil soup. I use lots of fresh ginger, cumin and a touch of red pepper for a little kick. It’s my absolute favorite snow day meal. Love the blog thanks for all the great recipes! I never bake cayenne but since it used so often in great sounding recipes that I think I really need to try it. I love adding cumin to black beans! Cinnamon is my favorite spice. I sprinkle it on oatmeal, on toast, and in coffee. I bake with it too. I think my favorite indulgence is a big, warm cinnamon roll with cream cheese frosting. Cinnamon is also very good for you, so that’s a bonus! I love a good paprika rub over a piece of chicken or fish. I can’t think of a more beautiful color! Beautiful images! Always an inspiration! My daughter introduced me to a new spice : Zatar. I think it goes well on eggs and would got nicely with this recipe . A bit of chipotle might be good on the acorn squash recipe you posted today! Well, I know what a great combination this is, because I’ve built a business around it!! My company, Yummy Yammy, which I started in my home kitchen in Vermont, makes Mexican Sweet Potato Salsa in Mild, Medium, & Hot. (There’s also Moroccan and Tuscan flavors!) So I can attest to the creativity and deliciousness of chipotle with sweeties. Yam on! My absolute favorite spice is Saigon cinnamon, but I’m afraid the way I use it most often is totally predictable: my morning oatmeal. Delicious nonetheless! I love spicy molasses cookies with cinnamon, allspice, ginger, and nutmeg (especially during the holidays!) But, I would love to feel more knowledgeable about how to use different spices and when- what goes well with certain dishes, etc. I am still learning! I love spicy and flavorful dishes, but I’m not that great of a cook. My go to spice is dill. The kiddo & I love it on scrambled eggs in the mornings. My new favorite is tumeric. In smoothies, soups, yogurt, hot milk, curries, and I hope to try it in cake soon! Cinnamon of course, but I’m ALWAYS reaching for a pinch of crushed red pepper, especially with greens!! Curry! If I have some potatoes or squash around and I need a quick dinner idea, I bake them and throw some milk/cream/water/broth and add some sea salt and curry- delicious! My favorite is some cayenne pepper, whether for seafood, veggies or a bit of pasta-gives it a bit of zip. Also, for an interesting combo, pair it with a bit of celery salt-a little tangy, and you need a little salt anyway! And I have to agree with one of the posts below–cinnamon is a pretty versatile spice to have! Thanks for all the inspiration! I use a lot of crushed red pepper and cilantro in my dishes. I also adore the kick ginger can give. I really love ginger! I once stumbled across a recipe for butternut squash soup that called for a ginger-butter “drizzle” that went on the top of the soup. I was skeptical, but it was delicious! Ever since then I’ve found ways to incorporate ginger into my other butternut squash recipes (butternut squash risotto, your twice-baked stuffed butternut squash, your butternut squash mac and cheese…). I’ve just found the pairing to be quite to my liking! I love cinnamon and put it in most of my breakfasts, brownies, granola and even in chili! I love your recipes! I was first introduced to turmeric a few months back when I ran across a recipe for turmeric tea on the 101 Cookbooks blog. I’ve since fallen in love with its strong color, subtle flavor, and numerous health benefits. The tea is awesome, beeteedubs, but the spice itself is also great in curries and stews! I always add garam masala to my guacamole, it’s addicting! I also go through completely absurd amounts of cumin because I put it in absolutely everything. I just discovered your blog/site ~ so beautiful! I grow various herbs in my garden and one that I really enjoy is Winter Savory. I use it often along with a sprig of Thyme (also from my garden) in my kids favorite Onion Pie. You can also thinly slice white potatoes or fingerlings to add to your onion pie. But hmm, I guess you said spices, not herbs – I enjoy a nice red curry blend. It’s a wonderful addition to a simple tuna salad with apples. Hope you like the ideas. I use cinnamon & cayenne in my almond milk/frozen berry smoothies in the morning. Adds just a little kick; delicious! So delicious! What a great filling breakfast. Used chilli powder instead of chipotle as I was sharing with my toddler and didn’t want it too spicy! Topped it off with some smoked cheddar I had. I will be making this again! !